My five-year-old niece Grace has pneumonia, poor tyke, so today Lucas and I made her a get well card and picked her a bunch of flowers from the garden. There wasn’t much to choose from in bloom at the moment but I think we put together a fairly respectable mix of fragrant ‘Erlicheer’, some straggly scented pink stock and hellebores in shades of pink, cream, lime and burgundy. Last winter I put in 50 hellebores in a massed planting under a grove of silver birches at the end of our driveway – and they’re just beautiful right now. In my city garden, I planted loads of hellebores under a row of Michelia ‘Mixed Up Miss’ trees, but they struggled for moisture and invariably died. It’s a different story here: not only are they all covered in bloom, while I was stomping around them with my secateurs this morning I noticed dozens and dozens of self-sown seedlings popping up too. And free plants are just the best plants, aren’t they? 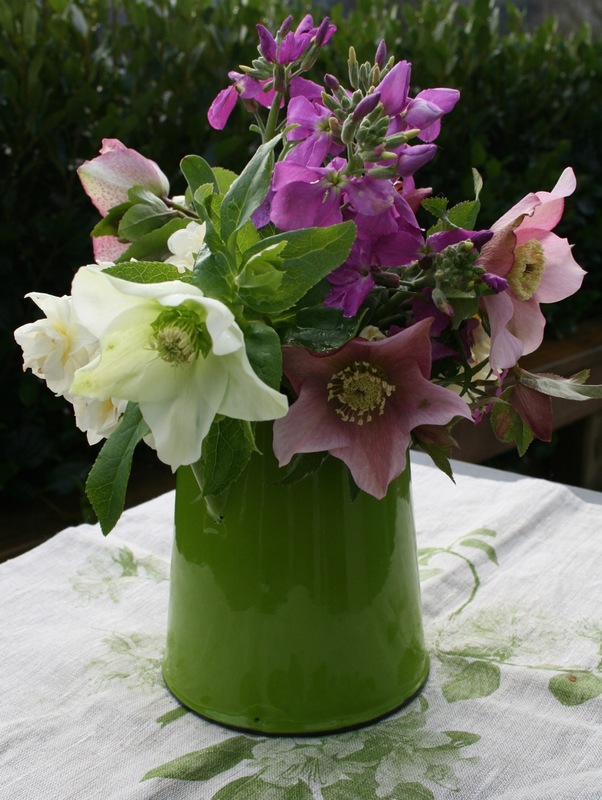 Thank you for your notes, I love hellebores, your posy gift should brighten the young lady’s day. What more thoughtful and precious gift for a little girl than colour, life and design from nature! Absolutely gorgeous array, Lynda and hope little Grace has recovered. I was wondering if hellebores would grow in shady south side of a Brisbane garden, as underplanting beneath a tree? I have never heard of Elicheer, must google it. J. Thanks from Miss Grace, the flowers were well sniffed and loved!! Hi Lynda, sorry to hear you too are now under the weather – hope you are soon up and at it again – at least the weather isn’t encouraging any of us to linger long outside. Get Well soon.